The mountains are calling and I must go! Camping season is upon us and it makes me giddy. And all of these handy gadgets and family camping gear get me even more excited. 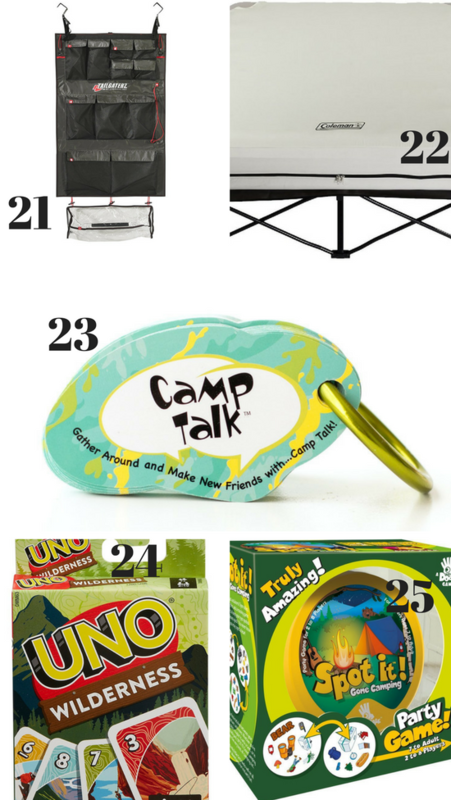 Some of us may not be camping fans but thanks to this list of camping essentials you may need to rethink that notion. We found the perfect family camping gear that takes the not-so-fun parts of camping and makes them much more manageable or even nonexistent. Take a look, and see if you still aren’t a fan. We found the best! 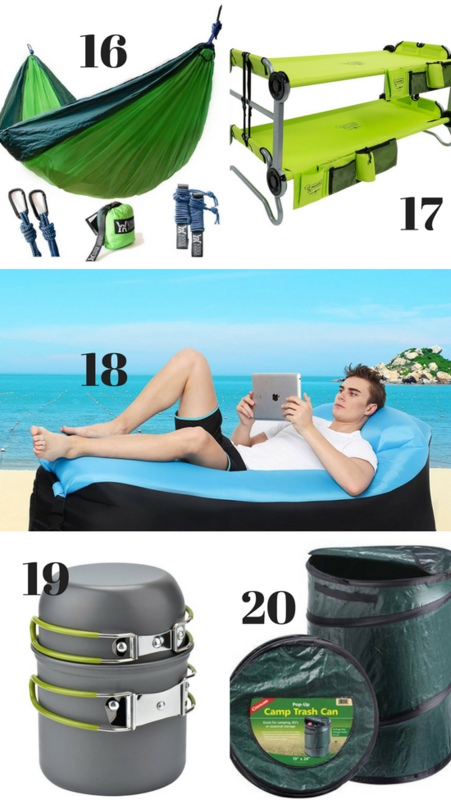 This list would also be perfect for those who love camping but seem to have every gadget in the book, talk about the perfect camping gifts. 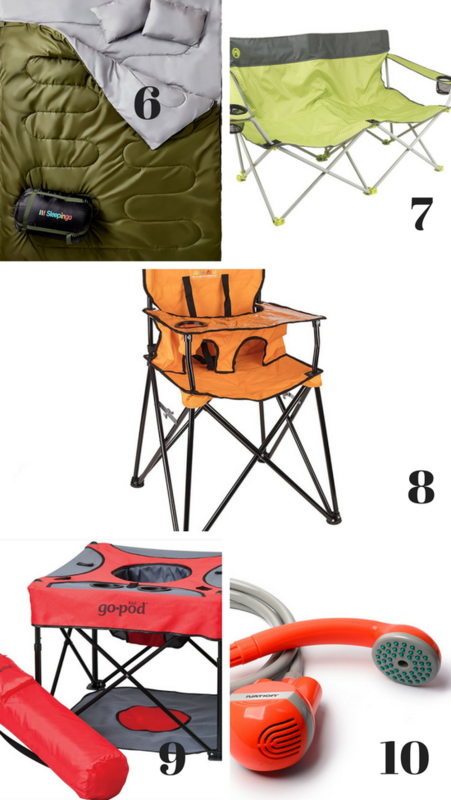 They will LOVE you, now let’s get started on this amazing list of unique camping equipment. 1. Extending Marshmallows Roasting Sticks – We all know how obnoxious it is to travel with long sharp roasting sticks. This solves all our problems! 2. Mystical Fire – Changes the color of your fire and it’s like magic! 3. 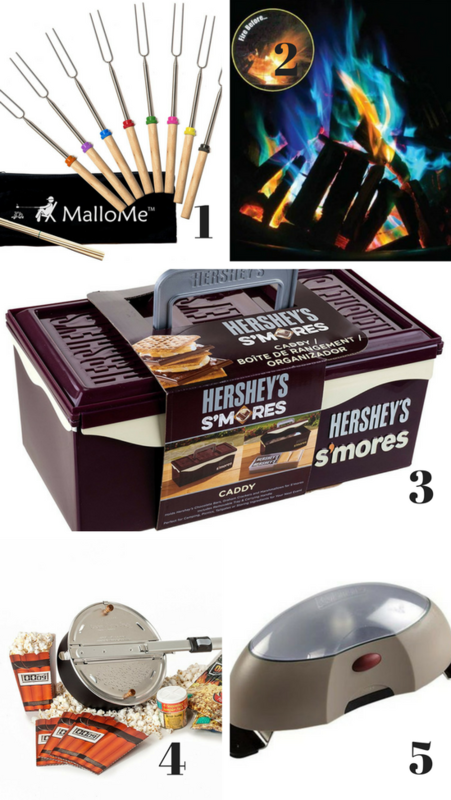 S’mores Caddy – Carries all the necessities for S’mores! 4. Open-Fire Popcorn Popper – Fresh popped popcorn while camping?! Need I say more? 5. Tent Light – Cause searching around in the pitch black for your necessities is never fun. 6. Queen Size Sleeping Bag – Seriously, the BEST! So warm and cozy plus I can snuggle up to my babe when I hear a bear outside. 7. Camping Loveseat – Perfect for cuddling up next to the fire for scary stories! 8. Camping Highchair – GENIUS! We have also taken ours to Lake Powell for the beach and it was perfect! 9. Portable Baby Activity Station – Great for when you just need to set the babe somewhere real quick and don’t want them getting dirty. 10. Portable Outdoor Shower – Need this! I miss showers while camping and now I don’t have to! 11. Camping Kitchen – Makes cooking and cleaning a breeze! 12. Folding Double Wash Basin – Washing Dishes is the hardest part of cooking while camping, not anymore! 13. 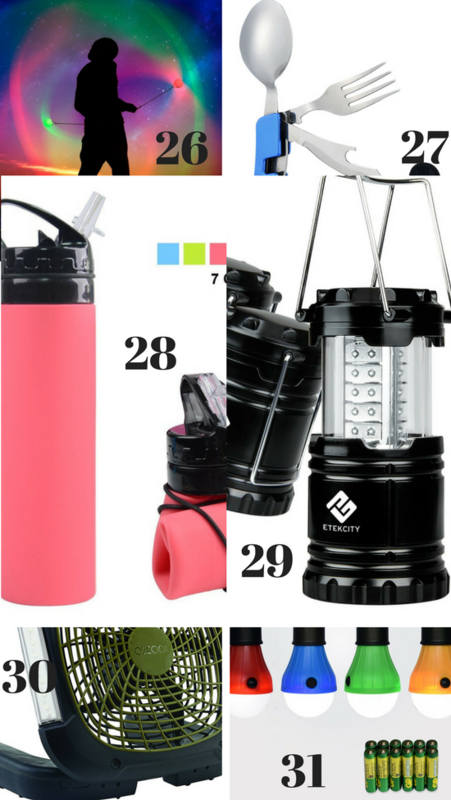 Camping Solar Water Bottle – Solar charge or USB charge turns your water bottle into an emergency flashlight. 14. Truck Bed Tent – Never worry about a rock in your back again! 15. Kids Camelback – Have your kids carry their own water! BOOM! 16. Camping Hammock – Relaxing and easy to set up. Plus, it fits 2 people! 17. Camping Bunkbeds – I call top bunk! I would love this so I don’t have to sleep on the ground. 18. Inflatable Lounger – Doesn’t that just look so fun and comfy?! 19. Camping Pots and Pans – Nice and compact making them convenient for packing. 20. Pop-Up Trash Can – So perfect cause once you’re done, it collapses so tightly! 21. Hanging Organizer – Great for keeping all your gear and gadgets organized and off the dirt. 22. 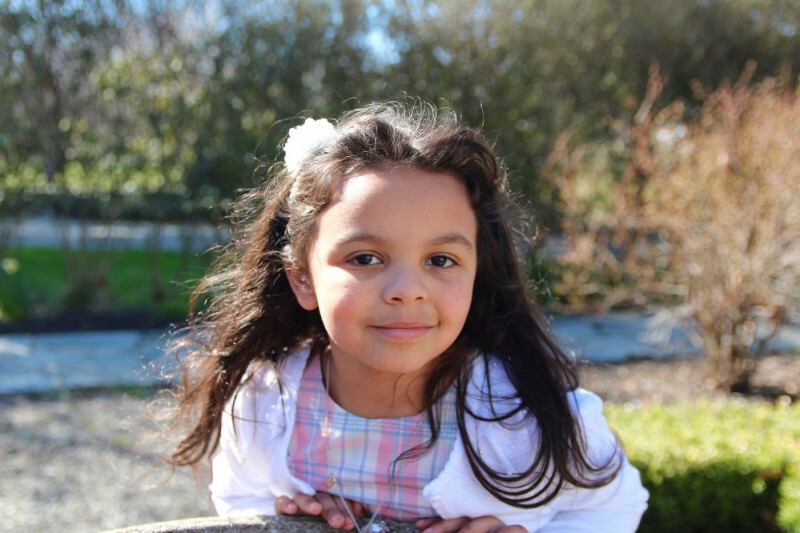 Queen Airbed Cot – Camping or Glamping?! So dreamy! 23. Camp Talk – Sparks fun and easy conversation. 24. UNO Wilderness – Everything we love about UNO with a wilderness twist. 25. Spot It! Gone Camping Card Game – Such a fun game for such a wide variety of ages. 26. Glow Ball – Glow in the dark balls, and make sure to buy two for EXTRA fun. 27. Utensil Set – Nice and small plus, it is great cause sometimes a fork just isn’t as good as a spoon! 28. Collapsible Water Bottle – Once you are done drinking, roll it up for tight packing. 29. Camping Lantern – Ultra-bright 4 pack of lanterns with batteries included. Perfect for one in all 4 corners of your campsite. 30. Portable Camping Fan – Great for summer camping when you are toasty and there is no breeze outside. 31. Portable Camping Lights – Perfect for hanging in your tent or from a tree to see the trail in the night. See what I mean?! With that queen size cot and truck tent you never have to worry about a rock in your back again! And then there’s the portable shower and the camping kitchen, you are seriously set! Plus, I love the stuff for camping with a baby, cause that will be us this year! Don’t you think you could handle camping now? I think so! 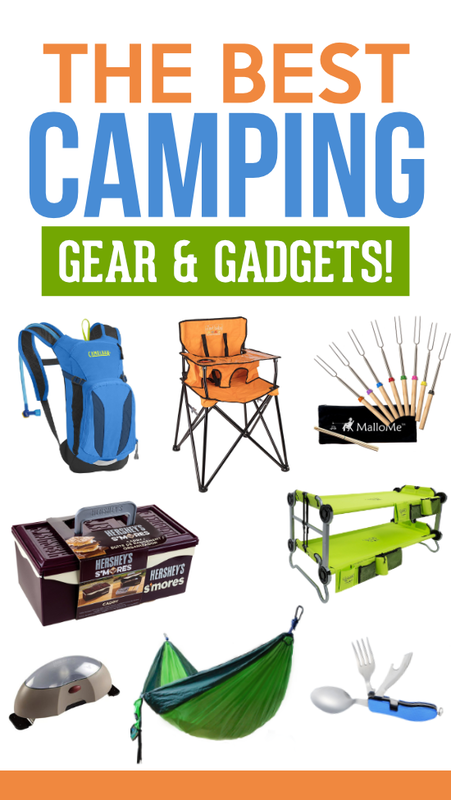 Grab some of this amazing family camping gear and take off to the mountains, you won’t regret it! And to make camping easier and more enjoyable look at our Family Camping Trip Kit! It includes a binder full of checklists, camping menus, camping games, a scavenger hunt, and a smores kit. It makes camping a breeze and so much fun! 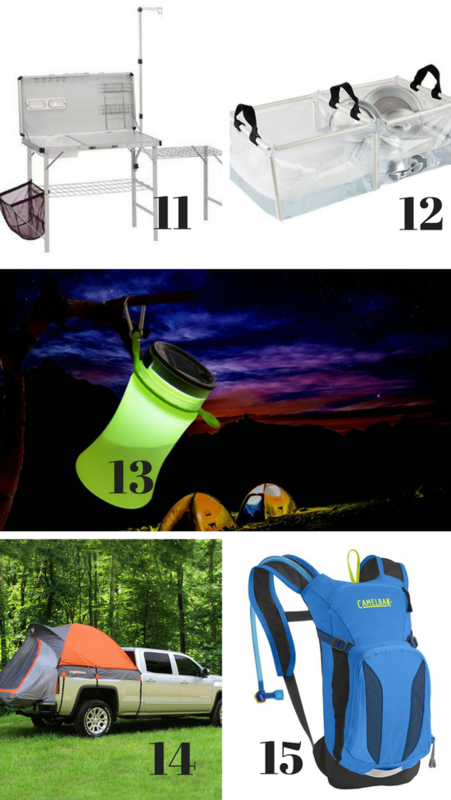 Save this list of camping gear and gadgets on Pinterest! And if you just really don’t want to do the full-on camping, we still have you covered! Check out our Backyard Camping Date!